EVENT RESCHEDULED DUE TO EXTREME WEATHER WARNINGS! We are absolutely gutted to announce that our London Printworks show on Thursday 1st March has been postponed. Due to extreme weather warnings we have been advised not to go ahead with the show. We feel as though it would be unsafe to bring you out in this weather. We have looked forward to putting on this show for so long and it is heart-breaking for us to have to postpone it. We hate to let customers down however it is essential that we prioritise safety. The issue is completely out of our hands but we promise to make it up to you all. We have rescheduled the show for Thursday 5th April. Please respond to this email within the next few days letting us know if you are happy for your tickets to be switched to this date. Please have Printworks in the subject of your email. If you are unable to attend the new show we will issue your refund immediately. You must tick at least one box for ticket type "EARLY BIRD / BONGO'S BINGO LONDON PRINTWORKS WITH ARTFUL DODGER: 01/03/18" to proceed to checkout. We strongly recommend ordering both the 'Event Ticket' and 'Gambling Stake' to get the full event experience. 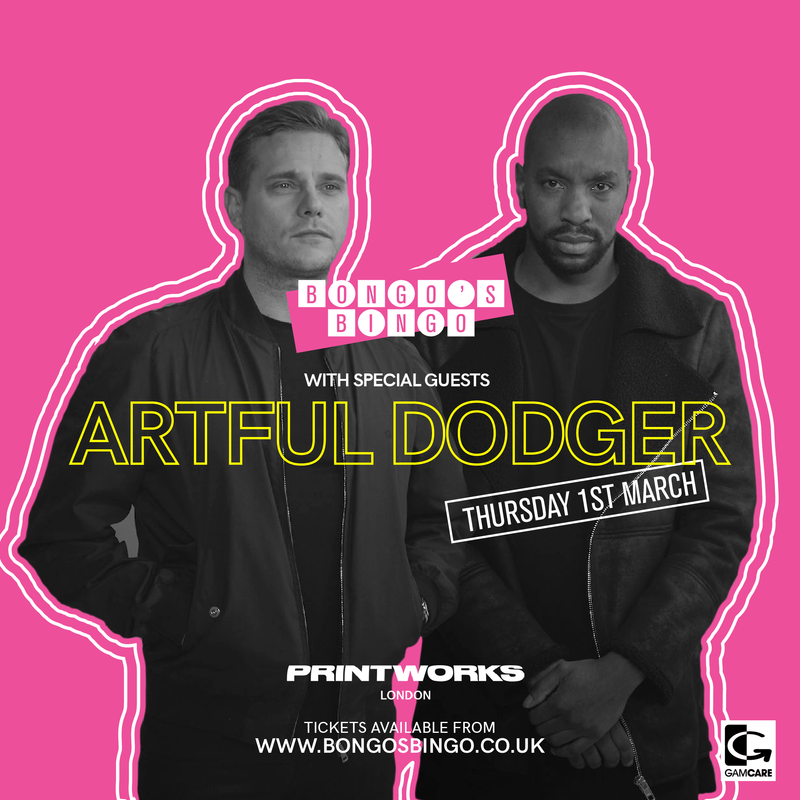 You must tick at least one box for ticket type "GENERAL RELEASE / BONGO'S BINGO LONDON PRINTWORKS WITH ARTFUL DODGER: 01/03/18" to proceed to checkout. We strongly recommend ordering both the 'Event Ticket' and 'Gambling Stake' to get the full event experience. You must tick at least one box for ticket type "FINAL RELEASE / BONGO'S BINGO LONDON PRINTWORKS WITH ARTFUL DODGER: 01/03/18" to proceed to checkout. We strongly recommend ordering both the 'Event Ticket' and 'Gambling Stake' to get the full event experience.